Grotesque was a short living band in the late '80s. 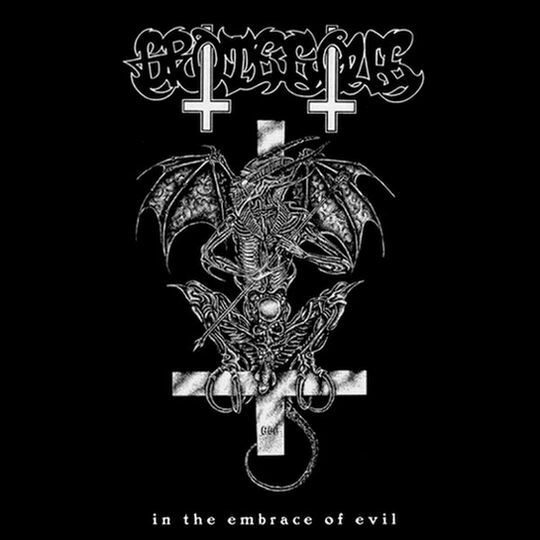 "In the Embrace of Evil" collects their demo records including the "Incantation" EP, which had the same cover too. It's an essential old school dose that leads the listener back to the early times of the underground scene. Grotesque's music was strongly thrash influenced, it doesn't fit to the line of the late black/death bands, but it's a bit different than the typical thrash/death hammerings. The vocal style is definitely black metal styled and maybe the sound fits too into this orientation, because these are mostly demo records. The influence of old Bathory could be assumed, but they didn't try to follow that way. The style of the that time currently spreading extreme ambitions sniffed up the band. Similar to '80s thrash bands, the speed also had and important role in their music, and there are plenty of '80s references to find. Of course the exact differences were not so fixed that time or didn't existed, and that shows up in their music too. 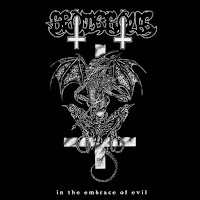 That made "In the Embrace of Evil" an exciting mix of thrash, black and death metal.